A portfolio of my past writing, and new stories as I develop them. Almost always deliberately funny. 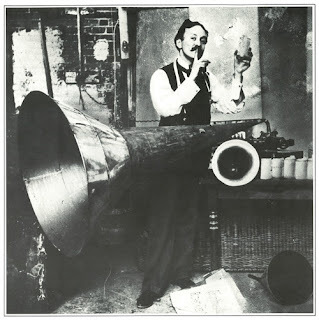 Lionel Mapleson and his enormous recording horn, used to record Metropolitan Opera excerpts live from the catwalks above the stage. On March 21, 1900, Metropolitan Opera librarian Lionel Mapleson purchased a gramophone for his personal use. Being an intelligent and curious man, he soon started using it to record operatic performance. The result is the first “live from the Met” recordings, long before the live Saturday radio matinees from thence started in 1931. Opera was seen as the most legitimate form of high culture at the time. This led to incredible snobbishness at the opera house, in contrast to the art form's former status as a populist entertainment over the course of the 19th century. The explosion of vernacular culture, and the technology to spread it, meant that the designation of value by a cultural elite was no longer needed, or heeded. Soon opera became a bugbear, something to be mocked by comedians. Opera in America wouldd not enjoy an upswing again until the 1980s. Over three frenzied years, from 1901 through 1903, Mapleson experimented with recording techniques. Initial recordings were made from the prompter’s box downstage center, but Mapleson soon crafted an enormous recording horn to more efficiently gather the sound, and began recording from above, in the theater’s fly space. The results range from pretty fair to nearly incomprehensible, and include performances from key opera singers such as Emma Calve, Nellie Melba, Jean and Edouard De Reszke, Fritzi Scheff, Pol Plancon, and Ernestine Schumann-Heink. These were names that inspired the same kind of fervent fan-worship today’s opera greats do, and the excerpts are invaluable in terms of getting a sense of the weight and timbre of these historic voices. There recordings don’t shed much new light on the art form itself – opera has maintained a consistency of approach that makes many productions ever-current (or ever-outdated, if you prefer). But there’s something a little livelier about these cylinders – instead of the close-confined acoustics of the recording studio of the day, and the tinny accompaniment of a few instruments, the listener can hear and feel the broader resonance of the stage and the increased weight and texture of the orchestra’s contributions. Plus, there is something about working live that adds a soupcon of vivacity to the enterprise. Recordings could be made over and over again until they were “right,” but these on-the-fly snatches have much more immediacy. These recordings can be found her and there online, and there are some recordings which excerpt the collection. The definitive assembly of tracks, with copious notes, can be found at the Rodgers and Hammerstein Collection of Recorded Sound at the Lincoln Center Library – see the program notes here. The National Recording Registry Project tracks one writer’s expedition through all the recordings in the National Recording Registry in chronological order. Up next: Scott Joplin’s ragtime piano rolls. Recalled to life: or, where did my last six months go? "The journalists of the United States are usually placed in a very humble position, with a scanty education and a vulgar turn of mind." Eric Dolphy, Out to Lunch!